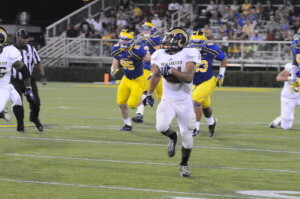 WEST CHESTER — Former West Chester University Ram running back Rondell White has committed to the West Chester Bluebirds in 2016. The 2013 Harlon Hill Award Finalist will join former WC Bayard Rustin teammate Lee Kurfis in what is shaping up to be a potent offense for the new minor league team. During his college career, White became the second (and first division 2) player to reach 4,000 rushing yards, 2,000 receiving yards and 1,100 return yards during his career. The other member of that club; Villanova Wildcat and Philadelphia Eagle running back Brian Westbrook. He finished his senior season averaging over 200 all purpose yards per game and was rated 113th nationwide at his position going into the 2014 NFL Draft. Rondell will be participating in Saturday morning’s open tryouts as the Bluebirds’ coaching staff begin to put together the rest of the roster for the 2016 season. The tryouts will be held on November 21st at O’Shields-Stevenson Stadium on the campus of Cheyney University. Players interested in trying out for the Bluebirds and fans interested in meeting the team can find more information on both the tryouts and the event at the Bluebirds’ website, www.westchesterbluebirds.com.